That's the title of a remarkable new book by blogger, author, and Yorkshire County Cricket Club supporter Catharine Withenay. We often exchange tweets about the state of our dear old 'summer' game, but recent Twitter exchanges have instead focussed on her debut publication, a compelling memoir of time spent in Zambia. 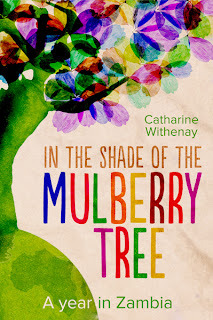 In the Shade of the Mulberry Tree is a winner (I've already started reading it in preference to the tottering Shard of unread books by my bed) so instead of talking about the contents I've invited Catharine to talk this morning about her journey into publishing. She writes..
My family moved to Zambia because of my husband’s medical research; the reason for returning to the UK in 2007 was his career. Finding myself in a new city, knowing no-one, I had lots of time on my hands and writing about our Zambian experiences became essential to retain my sanity. My youngest had just started school and I had all day to myself to write. There was so much to say - losing passports, meeting Mutende, adjusting to the pace of life, getting my hair cut, travelling around the country, The Bishop and The Professor. Within two years we had moved on again. So had the book: from a dodgy first draft to endless efforts at editing. And some attempts at acquiring an agent, with no success. It is hard to know if a book is worth publishing. One often repeated piece of advice is that you must ignore all the compliments from your friends and family and writing group because they are just being nice. That’s tough, because they are also your main support group and the people who will get you through the tricky days ahead. Time ticked on. Last November I set myself the NaNoWriMo challenge to write 50,000 words in 30 days. I knew I had more than one book in me about Zambia and I was determined to get it down on paper (well, into the computer’s memory at least!) I failed the challenge, but somewhere in the midst of it I decided that enough was enough: I knew my writing was good enough and I had to self-publish the book I’d written. Editing, proofreading and book cover design cost me money - quite a lot of it! But nobody wants to read something that has been flung together on a wet afternoon in Grimsby. [Not that there's owt wrong wi' Grimsby - Ed.] With all this in place, I had finally come to the first of my deadlines for publishing. I investigated various printing options. One publisher quoted me for printing 150 books, and I realised that I would have to sell 148 of them in order just to break even! As I suspected that I would give more than two away (my father, my husband, my children - just for starters!) this seemed a false start. My second route was Print on Demand. This scheme means that every paperback bought is printed to order: there are no spare copies lying around gathering dust in a storage facility. Again, I looked into various options but CreateSpace came out best because of its connection to Amazon (where millions of books are bought) and the pricing. By formatting and uploading it myself the only costs I incurred were to purchase proof copies, in the region of $10-20 each including postage from the US. I did have qualms about using Amazon, particularly as their stinginess in paying UK tax had just surfaced in the news, but the process was straightforward. Having logged in, they list of series of questions and tick boxes (e.g. Book Title, Author name, sizing, paper colour) and provided me with an ISBN number for free. I downloaded their template, copied and pasted my manuscript, and set to work. I am an accountant by profession and (yes, this does make me sad) I found the logic and discipline of setting out page numbers and section breaks, and the correct fonts and headings, remarkably therapeutic. (Well, motivated by tea and the promise of a cookie every few chapters, I was in my element! )Other PoD suppliers had additional costs for providing these services and I decided that was money I could save quite happily. kettle of fish entirely! The lead time is a lot less (once finished it is online within 12-24 hours) but the tedium of formatting for Kindle and other devices involved a lot more chocolate. Publishing books is clearly not going to be good for my weight loss campaign! Has it all been worth it? Yes! I still stare at the books in wonder that I actually created such a beautiful object. My friends are enjoying reading it, and my children will have it as a lasting record of their early years. Is it going to make me a multi-millionaire? I doubt it. I shall probably break even, perhaps enough to buy myself a treat. But I have enjoyed the process and I’m proud of the end result. Would I do it again? I have nearly 50,000 words from last November to edit and rewrite: of course I would do it again! In the Shade of the Mulberry Tree is available on Amazon in both paperback and Kindle editions and is highly recommended.